* What Are Climate Feedbacks? Agricultural practices should play an important part in climate change strategies, said Dr. James Hansen, director of NASA’s Goddard Institute for Space Studies. The physicist and climatologist known for predicting global warming in 1988 delivered the keynote address at the 2008 Kansas Wind & Renewable Energy Conference in Topeka. Hansen said that time is growing short to keep climate change from reaching a dangerous tipping point, beyond which climate change will continue to occur even without any additional increases in greenhouse gas (GHG) levels. There can be no doubt that the main driving factor in climate change is the increase in GHGs from human activities, he stressed. The primary GHGs include carbon dioxide (CO2), methane (CH4), and nitrous oxide (N2O). Of all the GHG emissions, CO2 is the single largest climate “forcing.” A forcing is a change in the planet’s energy balance, which tends to alter global temperature. It is critical to control CO2 emissions soon, before it’s too late, he said. Carbon dioxide has already increased from a preindustrial level of 280 parts per million (ppm) to 383 ppm in 2007, and it is now increasing by about 2 ppm per year. The dangerous level of CO2, at which we will set in motion unstoppable changes, is at most 450 ppm, Hansen said. But the goal must be far lower than that, he added. In fact, the goal should be less than the current level. “We must adopt policies that take the planet’s atmosphere back to a CO2 level of 350 ppm or less. The acceptable level of atmospheric CO2 will depend upon how well we do in reducing other greenhouse gases,” he said. Why does the CO2 level need to be lower than it is today? Humanity and natural ecosystems adapted to the climate and the sea level that has existed for the past 12,000 years during the Holocene period, Hansen explained. This climate developed under atmospheric CO2 levels of about 280 ppm. Civilization’s infrastructure was built under this general climate structure, and depends on the stable sea level that has existed during this period. Global temperatures are currently on the verge of extending beyond the bounds of anything seen so far during this period, he said. Global temperature is increasing by about 0.2°C per decade, with fluctuations from year to year, he noted. With rapid warming of 0.6°C in the past 30 years, global temperature is at its warmest level in the Holocene. “The ‘safe’ global temperature level is, at most, about 1°C greater than the year 2000 global temperature,” he said. Sea level is now increasing at a rate of about 3 cm per decade or about one-third of a meter per century. This rate of sea level rise is about twice as large as the rate in the twentieth century. The main concern about sea level, however, is the likelihood that continued global warming could lead to ice sheet disintegration and much greater sea level increase. The prior interglacial period was warmer than the current one by at most 1°C on global average, yet sea level was as much as 4-6 meters higher. The last time that global surface temperature was as much as 2°C warmer than now was in the Pliocene, 3-5 million years ago, when sea level was about 25 meters higher. If all fossil fuels were burned, more than doubling the amount of CO2 in the air, the eventual global warming would be expected to exceed 3°C, possibly leading to an ice-free planet, as in the early Cenozoic, with sea level about 75 meters higher. Figure 1. 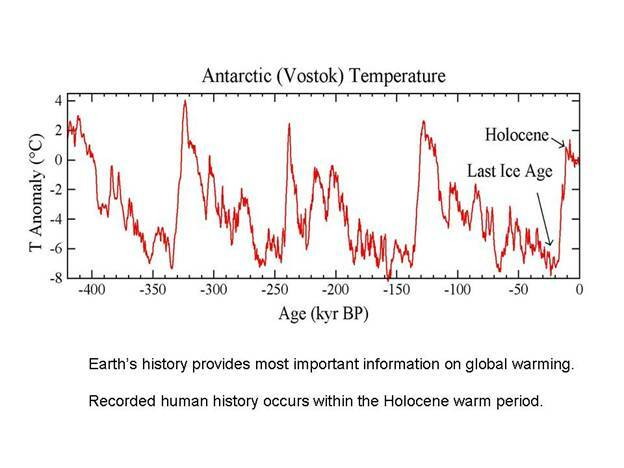 Temperature fluctuations over the past 400,000 years. The term “kyr BP” stands for “thousands of years before present,” so that -400 = 400,000 years ago. 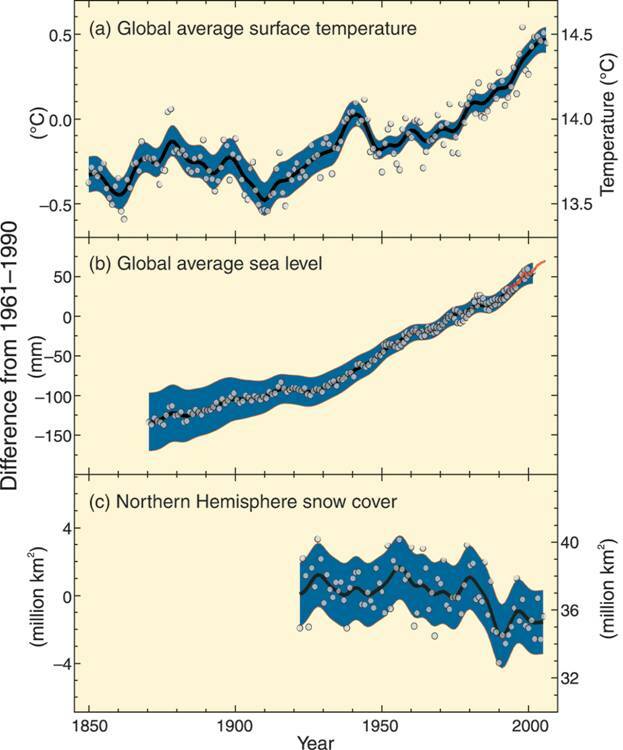 An examination of climate data beginning in 1850, from the Fourth Assessment Report of the U.N. Intergovernmental Panel on Climate Change, reveals that global average surface temperatures and sea levels are increasing, while Northern Hemisphere snow cover is decreasing. How can the goal of 350 ppm CO2 be reached? It will take a combination of actions, Hansen said, including help from agriculture and forestry. “If CO2 emissions from coal were phased out over the period 2010-2030, and if use of unconventional fossil fuels (tar shale, tar sands) remained negligible, atmospheric CO2 would peak at 400-425 parts per million (ppm). In that case improved forestry and agricultural practices, especially reforestation, could get atmospheric CO2 back beneath 350 ppm within a century or less. During the overshoot phase we might hope that ocean and ice sheet inertia may keep climate impacts tolerable, avoiding the most disastrous effects. However, if coal use continues or expands, CO2 will be headed to the 500-600 ppm range, or even higher if unconventional fossil fuels such as tar shale are developed,” Hansen said. That is dangerous territory. Hansen offers the following four-point strategy to avoid dangerous climate change. 1. Coal and unconventional fossil fuels must be curtailed and used only with capture and sequestration of the carbon dioxide underground. Existing coal-fired power plants should be phased out over the next few decades. 2. Carbon price and efficiency standards must be implemented. Recognizing the unusual energy concentration and mobility of fossil fuels — with which little else can currently compete — the practical way to transition to a post-petroleum era is to impose a moderate but continually rising carbon price. The price can be via a tax on fossil fuels, a ration-and-trade system that limits impacts on people least able to afford an energy tax, or a combination of methods. This will make fossil fuels pay for environmental damage while stretching remaining oil and gas to accommodate sustainable economic growth. 3. Steps must be taken now to draw down atmospheric CO2. Farming and forestry practices that enhance carbon retention in the soil and biosphere must be supported. Biofuel power plants with carbon sequestration can draw down atmospheric carbon dioxide, putting anthropogenic carbon dioxide back underground. Carbon dioxide can be sequestered beneath ocean sediments and in other safe geologic sites. Reforestation of degraded land and improved agricultural practices that retain soil carbon could draw down atmospheric CO2 by as much as 50 ppm. Additional significant CO2 reduction could be achieved by using carbon-negative biofuels to replace liquid fossil fuels and phasing out emissions from natural gas-fired power plants, according to the authors. A combination of these approaches could bring CO2 back to 350 ppm well before the end of the century. 4. We must take steps to reduce other, non-CO2 forcings, especially black soot, methane, and ground-level ozone via stricter regulations. The next President must make a national low-loss electric grid an imperative, Hansen added. “This will allow dispersed renewable energies to supplant fossil fuels for power generation. Technology exists for direct-current high-voltage buried transmission lines. Trunk lines can be completed in less than a decade and expanded analogous to interstate highways,” he said. Historically, environmental pollution problems have not been seriously addressed until they hit with full force, Hansen said. That wait-and-see approach will not work in the case of CO2 emissions and climate change because of inertial effects, warming already in the pipeline, the effect of various feedback mechanisms, and the danger of reaching the tipping point. On the contrary, ignoring emissions would lock in catastrophic climatic change, he said. “If we go over the edge, we will transition to an environment far outside the range that has been experienced by humanity, and there will be no return within any foreseeable future generation. Casualties would include more than the loss of indigenous ways of life in the Arctic and swamping of coastal cities. An intensified hydrologic cycle will produce both greater floods and greater droughts. In the U.S., the semiarid states from central Texas through Oklahoma and both Dakotas would become more drought-prone and ill-suited for agriculture, people, and current wildlife. Africa would see a great expansion of dry areas, particularly southern Africa. Large populations in Asia and South America would lose their primary dry season freshwater source as glaciers disappear. A major casualty in all this will be wildlife,” Hansen said. Climate changes caused by increased levels of greenhouse gases are amplified by other changes within the climate system, known as feedbacks, said Dr. James Hansen, director of NASA’s Goddard Institute for Space Studies, speaking at the 2008 Kansas Wind & Renewable Energy Conference in Topeka. Hansen said there are both fast and slow feedbacks. Fast feedbacks — changes that occur quickly in response to temperature change — amplify the initial temperature change, resulting in additional warming. As the planet warms, fast feedbacks include increased levels of water vapor (due to higher evaporation rates), which traps additional heat; and less snow and sea ice, which exposes dark surfaces that absorb more sunlight. Slower feedbacks also exist. Due to warming, forests and shrubs are moving poleward into tundra regions. Expanding vegetation, darker than tundra, absorbs sunlight and warms the environment. Another slow feedback is increasing wetness (i.e., darkness) of the Greenland and West Antarctica ice sheets in the warm season. Finally, as tundra melts, methane, a powerful greenhouse gas, is bubbling out. Paleoclimatic records confirm that the long-lived greenhouse gases — methane, carbon dioxide, and nitrous oxide — all increase with the warming of oceans and land. These positive feedbacks amplify climate change over decades, centuries, and longer. Global warming so far, about two degrees Fahrenheit over land areas, seems almost innocuous, being less than day-to-day weather fluctuations, said Dr. James Hansen, director of NASA’s Goddard Institute for Space Studies, speaking at the 2008 Kansas Wind & Renewable Energy Conference in Topeka. But more warming is already “in the pipeline,” delayed only by the great inertia of the world oceans. And the climate is nearing a dangerous tipping point, Hansen warned. A tipping point in the climate system occurs when there are large, ready positive (amplifying) feedbacks, such as Arctic sea ice, West Antarctic and Greenland ice sheets, and frozen methane hydrates, he said. These feedbacks can partner with the inertia of the oceans and ice sheets to create a situation in which the warming in the pipeline, due to human-made greenhouse gases (GHGs) already in the air, can carry climate to large rapid changes without any additional forcing. Another critical fact is the long lifetime of fossil fuel CO2 emissions, Hansen pointed out. “Half of a fossil fuel CO2 pulse disappears within 20-30 years, mostly into the ocean. However, much of the CO2, about one-fifth, is still in the air after 1,000 years,” he said. Climate can reach points such that amplifying feedbacks spur large rapid changes. “Arctic sea ice is a current example. Global warming initiated sea ice melt, exposing darker ocean that absorbs more sunlight, melting more ice. As a result, even without any additional greenhouse gases, the Arctic soon will be ice-free in the summer,” Hansen said. More ominous tipping points loom, he added. “West Antarctic and Greenland ice sheets are vulnerable to even small additional warming. These two-mile-thick behemoths respond slowly at first, but if disintegration gets well underway it will become unstoppable. Debate among scientists is only about how much sea level would rise by a given date. In my opinion, if emissions follow a business-as-usual scenario, sea level rise of at least two meters is likely this century. Hundreds of millions of people would become refugees. No stable shoreline would be reestablished in any time frame that humanity can conceive,” he said. Animal and plant species are already stressed by climate change, he noted. “Polar and alpine species will be pushed off the planet, if warming continues. Other species attempt to migrate, but as some are extinguished their interdependencies can cause ecosystem collapse. Mass extinctions, of more than half the species on the planet, have occurred several times when the Earth warmed as much as expected if greenhouse gases continue to increase. Biodiversity recovered, but it required hundreds of thousands of years,” he said. If climate change occurs as projected, it could have a significant effect on agricultural producers, said Jerry Hatfield, director of the USDA-ARS National Soil Tilth Laboratory in Ames, Iowa. Hatfield spoke at the 2008 K-State Research and Extension Annual Conference in Manhattan, Kansas. The biggest effect that climate change will have is the increased variability and uncertainty of weather events, especially precipitation, Hatfield said. This will make it difficult for producers to adapt to climate change. “The increase in precipitation variability within the seasons is among the most important factors about climate change for agricultural producers,” he said. In the big picture, climate change will result in the movement of entire agricultural growing zones. Wheat, corn, and soybean production, for example, will move northward. This has already happened in the Indian sub-continent, he said. As another example, corn and soybean production has expanded recently in South Dakota. The effect of warmer temperatures on crop production is complex, Hatfield explained. “The warmer it is, the faster plants grow during the vegetative and reproductive stages. But this does not mean they will be more productive. The critical factor is how warmer temperatures will affect pollination,” he said. Every crop has an ideal temperature range for pollination. And every crop also has a critical temperature above which pollination failure occurs. For corn, the “failure temperature” is 95 degrees Fahrenheit (F). For soybeans, it is 102 degrees F.
“As the climate gets warmer, there is a greater chance that temperatures will be too high during the critical reproductive periods of crops. This means a greater chance of crop failures,” Hatfield said. The reproductive period also tends to get shortened at higher temperatures. One of the projections about climate change during the next 100 years is that nighttime temperatures will increase even more than daytime temperatures. These higher nighttime temperatures will also adversely affect crops, he added. When temperatures are too warm at night, respiration continues at a higher rate and less energy is available for grain development. Overall in the U.S., higher temperatures during this century are projected to decrease corn yield by about 4 percent; wheat yields by 6.7 percent; sorghum yields by 9.9 percent; cotton yields by 5.7 percent, and rice yields by 12.0 percent. Soybean yields in the Midwest are projected to increase by 2.5 percent (the pollination failure temperature for soybeans is high enough that it won’t be reached more often than normal in the more northern latitudes), but soybean yields in the South are projected to decrease by 3.5 percent. The development of forages will be hastened by warmer temperatures, and the growing season will be lengthened, he added. This will have a negative impact on forage quality and protein content. Fruit and nut crops will begin flowering earlier in the growing season, making them more susceptible to late spring freeze injury. Overall, increasing temperatures will expose all plants to more extreme conditions and will potentially limit the reproductive periods of plants growing at their current locations. Increasing temperature will require a change in planting dates or tolerant varieties to avoid exposure to high temperatures, he said. Climate change will also mean higher CO2 levels and more variable precipitation patterns, Hatfield noted. Precipitation events are projected to be less frequent, but more intense. The patterns of precipitation distribution will be changing. The effect of higher CO2 levels is complicated, he said. If all other factors remain the same, higher CO2 levels would have a positive impact on crop yields, Hatfield said. But along with higher CO2 levels come higher temperatures and more variable precipitation patterns. Because of higher temperatures and more variable precipitation, soil water availability will be reduced, and the negative impact of this on crop yields will more than offset the positive effect of higher CO2 levels, he explained. In addition, the impacts of drought in the future will probably be increased due to climate change. More areas subject to prolonged drought are projected worldwide during this century. “Water availability and higher temperatures during pollination are projected to be among the primary limitations to plant growth and crop yields in the future,” he said. It will be even more important in the future that soils have high organic matter levels, which will provide more resiliency for coping with climate variability and periods of moisture deficits, he concluded. Reducing evaporation rates from the soil will also be important. Ironically, weeds may thrive under the projected climate change conditions. Higher CO2 levels and higher temperatures will increase the growth of many weeds, Hatfield said. Climate change will also affect livestock production, Hatfield said. All animals, including humans, have an optimum range of temperatures at which they are most comfortable. With cattle, when temperatures are too warm, their appetite is reduced and their rate of weight gain is reduced. Milk production and conception rates can also be reduced. Global climate change is likely to touch the lives of all Kansans during this century if greenhouse gas levels in the atmosphere are not controlled. The climate in Kansas is projected to become warmer by 2100, with substantial differences between eastern and western Kansas, according to Johannes Feddema, University of Kansas climate scientist in the Department of Geography. Feddema spoke at the 2008 K-State Research and Extension Annual Conference in Manhattan, Kansas. He reported results from a study that he and his colleague Nathaniel Brunsell did for the Climate and Energy Project of the Land Institute in Salina, Kansas. To make the projections in this study, Feddema and Brunsell tested 21 climate models approved by the U.N.’s Intergovernmental Panel on Climate Change (IPCC) against actual Kansas historical climate data from 1950-2000, then chose the three models that best reflected the variability of the Kansas climate. Next, they ran the models to create projections for 2010-2100, according to a “middle of the road” IPCC assumption about increases of greenhouse gases in the atmosphere. The projections in the report are only projections, not predictions, Feddema stressed. If greenhouse gas emissions are controlled and mitigation efforts are put in place to reduce atmospheric levels, then the projected changes can be altered. Western Kansas will become warmer and drier. Soil moisture will decrease, putting more pressure on irrigation. During the summer, the need for water by plants will increase as much as eight inches because of rising temperatures. Eastern Kansas will become warmer. Precipitation will be slightly greater, but the higher temperatures will likely more than offset any increases in precipitation due to the increase in evaporation rates. The result will actually be an overall drying effect. Less water will be available for rivers and reservoirs in winter, and plant stress will increase in summer. Temperatures in Kansas will rise in all seasons, in all parts of the state, by an average of 2 to 4 degrees Fahrenheit (F). Southwest Kansas could see a rise as steep as 8 degrees F.
· Higher summer temperatures will create more heat waves. The number of cooling degree days (the days that people run their air conditioning) will increase by about 50%. Higher summer nighttime temperatures will also stress livestock and crops. · Freezing days will decrease during the winter. By 2060, winter temperatures will mostly stay above freezing. The number of heating degree days (the days that people run their heaters) will decrease by about 25%. The lack of hard freezes means that insects will thrive and diseases will increase among plants, animals, and humans. Mosquitoes and ticks will thrive. What does this mean for Kansans? It will probably cost less to heat your home in the winter, but you will pay for more air conditioning in the summer. Air conditioning is less energy-efficient than heating, so more energy will be wasted. Higher temperatures intensify human health problems – heart disease, respiratory diseases (like asthma), and the spread of epidemic disease. In urban areas, heat waves also lead to increased deaths especially among the elderly and other vulnerable populations. Higher summer nighttime temperatures are bad for crops – for example, wheat needs cool nighttime temperatures. Hot nights lead to plant stress, which leads to yield loss. Higher temperatures also stress livestock and alter the species composition of rangeland grasses. Some have asked: Isn’t a longer growing season and more carbon dioxide (CO2) better for crops? Not necessarily. The benefits are canceled out by the problems. The longer growing season comes with increased temperatures, and higher temperatures increase plants’ need for water – but precipitation will remain about the same. As a result, evapotranspiration rates will increase, and soil moisture will gradually decrease. In Kansas, crop yield depends on water availability, not on CO2 levels. Increased CO2 levels do not help plants unless there is adequate soil moisture, moderate temperatures, and additional levels of nutrients in the soil. It should also be mentioned that USDA research has shown that weeds thrive extremely well under high CO2 conditions. Tests have also shown that herbicides such as glyphosate don’t work as effectively in higher CO2 environments. Precipitation patterns and intensity will become more variable. Yearly precipitation totals will stay about the same, but precipitation patterns will shift, becoming less predictable and less frequent, broken up by longer periods of dry weather. Across the state, precipitation will generally decrease in summer and fall. In eastern Kansas, winter and spring precipitation will increase. In western Kansas, spring precipitation will decrease. There will be fewer snow events. Precipitation will concentrate in more severe events – less frequent but more intense storms. Why do models project that storms will become more intense? The reason lies in the projected changes in global temperature patterns. When a warmer atmosphere melts more of the polar ice caps, temperature extremes between the poles and the equator start to even out. The lack of contrast between cold and warm air slows global air circulation patterns. High pressure systems will stay in place longer. Weather systems will get trapped over one area for extended periods of time. Temperatures will rise and evaporation rates will increase, resulting in the need for additional water. Annual precipitation amounts will not increase to meet this need, however. Western Kansas will become warmer and drier. Soil moisture will decrease, putting more pressure on irrigation. During the summer, water need (the measure of how much water plants must have to grow) will increase as much as eight inches. Eastern Kansas will become warmer, with slightly higher precipitation. However, the higher temperatures will more than offset any increases in precipitation, due to the increase in evaporation rates. The result could actually be an overall drying effect. Less water will be available for rivers and reservoirs in winter, and plant stress will increase in summer. Increased temperatures will create drying, which will result in a slight decrease in soil moisture surplus during winter. This means reduced water flow into rivers and reservoirs. Water deficit (a measure of water need that has to be made up by irrigation) will increase significantly during the summertime, especially in western Kansas. Water availability will be the key to how plants, animals, and even humans respond to climate change. The balance between water and temperature cycles will shift – for example, when plants need more moisture during higher summer temperatures, there will be less water available. The need for water management strategies will increase. Reservoirs, the Ogallala Aquifer, river systems, and groundwater will experience additional stress. Extreme weather events will cost local and state governments for preparedness, response, and recovery. Already stretched rural infrastructures will bear the burden of initial responses to these disasters. Intense weather events damage crops, increase erosion and runoff, and keep farmers from getting into fields at crucial times in the growing season.